Mrinal Sen, the legendary director of Indian cinema based in West Bengal was remembered by cultural activists, filmmakers and critics from home and neighbouring India at a memorial meeting here on Friday. Liaquat Ali Lucky, Director General (DG) of Bangladesh Shilpakala Academy, presided over the meeting hosted jointly by Bangladesh Shilpakala Academy, Federation of Film Societies of Bangladesh (FFSB) and Bangladesh Short Film Forum held at National Music and Dance Center of Shilpakala Academy on Friday. The commemoration ceremony began with illumination of lamps remembering the noted filmmaker. Mrinal Sen, born in Bangladesh’s Faridpur district on May 14, 1923, died of a cardiac arrest at his residence in Kolkata on December 30, 2018. He was 95. 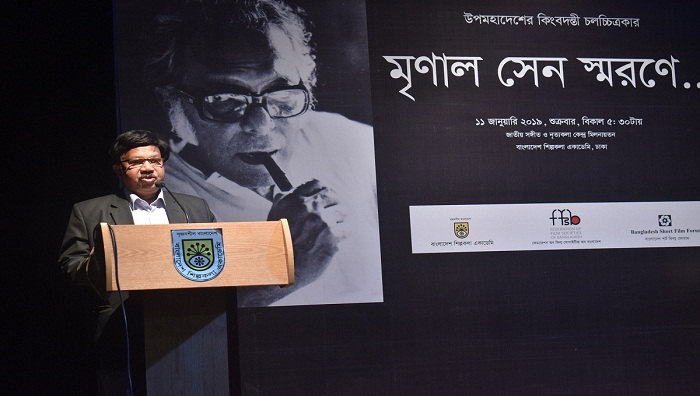 While remembering the legend, Liaquat Ali Lucky deeply grieved the death of the director and announced that the Shilpakala Academy will hold year-long events to spread his works among the country’s people. “It is a matter of our (Bangladesh’s) pride that all of the three most respected filmmakers of Bangla language (Satyajit Ray, Ritwik Ghatak and Mrinal Sen) have their roots in Bangladesh,” he added. Bangladesh Short Film Forum General Secretary Belayet Hossain Mamun urged the government to take steps for preserving what remains of the director’s ancestral homestead in Faridpur. Federation of Film Societies of India (FFSI) President Premendra Mazumder drew lights on several aspects of the life of Mrinal Sen and described him as formidably creative yet a light-hearted person. He also resonated with Mamun’s plea and assured help from FFSI. Nahid Masud, brother to the legendary Bangladeshi Director Tareque Masud, recalled how Mrinal Sen had backed and garneted support from the cultural figures when Tareque’s Matir Moina was denied release in India. Director Akram Khan and FFSB General Secretary Zahidur Rahman were also present at the event alongside other noted fellows of art and culture.